Re-reading the Fantastic Four comics from the start. When I started this re-read, annual #2 was one of the comics I wanted to spotlight, in the hopes that it might, finally, was away the two live-action films from my mind, and that maybe, just maybe, I can make my case as to a better direction they could have gone. From there, we flash back to ye olden times, where gypsies had once made camp on that spot, someone comes running, with a warning for young Victor Von Doom, that soldiers have come to seize his father. We meet Werner Von Doom, who is the gypsies’ medicine man. The soldiers order man away from his tribe, even as he argues the tribe needs him. He assures his young son that all will be well, and that he will not be harmed. The little boy, our very own Victor Von Doom, doesn’t believe this, and it’s a teary farewell. The local baron demands that Werner treat his ailing wife. The woman is dying, and beyond help, but the baron believes that Werner’s gypsy magic can cure anything. Knowing there’s nothing he can do, Werner flees in the night. The baron’s wife is dead by morning, and the baron blames Werner. The Baron’s troops destroy the gypsy camp, with Werner and Victor on the run. In the harsh wilderness, Werner sacrifices himself so that Victor may survive. Werner dies back at the reunited gypsy camp. His mother having been murdered when he was infant, young Victor swears revenge, not just against the baron and his soldiers, but against all mankind. Victor learns of his father’s many healing potions. He then gets into his mother’s old things and discovers she was once a powerful sorceress. Years pass, and we see Victor get wealthy by pulling off a series of elaborate plots, scheming money away from the wealthy. He even invents a mechanical duplicate of himself to face a firing squad in his place. Eventually, he’s contacted by an American, who offers him a scholarship at State University. Victor takes him up on the offer. 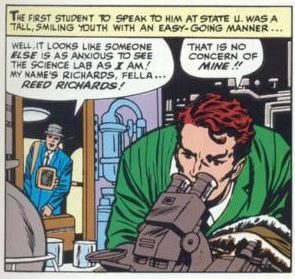 Once there, Victor meets another student, one Reed Richards. 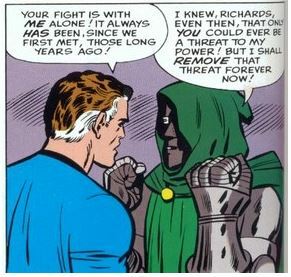 Reed makes several attempts to be friendly, including an offer to be roommates, but Doom won’t have it, believing him to be superior. Reed instead rooms with a young football star, Ben Grimm. Reed does a little snooping, and finds Doom has been researching dimension warps. Reed says Doom needs to re-check his figures, but Doom still doesn’t want anything to do with Reed. Doom builds a machine to contact the “nether world,” and he hooks himself up to it. Too bad for him that Reed was right about the equation needing more work, and the machine blows up in Doom’s face, permanently scarring him. He’s also expelled from school for his reckless ways. Doom travels to Tibet, where some mysterious monks take him in, teaching him the ways of dark magic. In a giant furnace, he builds his armor and mask, declaring himself Dr. Doom, and making a promise that he, a son of a gypsy and sorceress, will prove his superiority and become master of all mankind. Back in the present, Doom marches back to his castle, as the Latverians regard him with gratitude, but also with fear. Doom retires to his lab, as the old man Boris wonders what technological wonder he’s working on this time. Meanwhile, in New York, the Fantastic Four (Remember them? It’s their book) are taking the Fantisticar out for a spin, where they get into a fender-bender with a car, and we get three pages of comedy shtick about Ben and the motorist arguing. Then, the scene abruptly shifts to outer space, where Doom is where we left him at the end of issue #24, floating all alone in the cosmos. (No idea when the first part’s frame story was supposed to take place.) He’s rescued by a passing spaceship, which just happens to be piloted by Pharaoh Rama-Tut, last seen in issue #18. They compare notes, with Rama-Tut revealing he pulled off his time traveling antics with Dr. Doom’s time machine. They speculate that Rama-Tut might be an ancestor of Doom’s or that they might even be the same man, from two different spots on the timeline. They both want revenge (of course) against the FF, but don’t dare attack together, as to not disrupt the timeline. Doom will stay in the present and Rama-Tut will travel – wait for it – back to the future. Doom lands in New York, and struts down the street, heading for the Latverian embassy, where the ambassador is conducting an interview, denying that a mysterious masked man really runs the country. This establishes that outside of Latveria, no one yet knows Doom runs the place. Doom instructs the ambassador to prepare a letter, announcing that the embassy is throwing a party. At the Baxter Building, the FF are delighted to be invited, not just for the party, but because the Latverians are offering Reed a science fellowship. At the fancy party, the ambassador treats the FF to a special Latverian “berry juice,” which makes them a little loopy, and causes them to hallucinate. Johnny thinks he sees Ben provoking him, and Sue thinks she sees Reed cheating on her. A fight breaks out among the four, but unlike their usual wacky bickering, this time it’s more like they’re really trying to hurt each other. 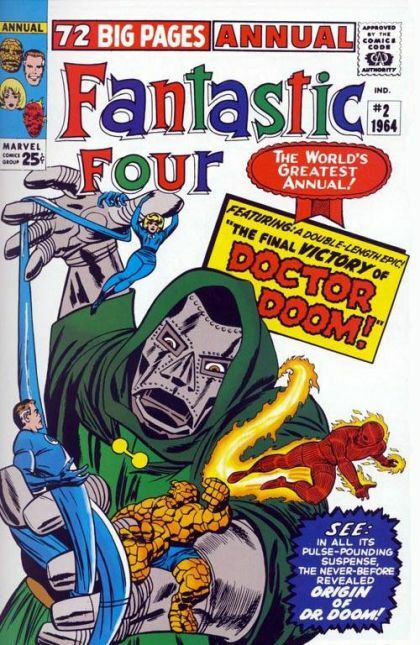 Enraged, Doom attacks Reed and Sue, revealing himself as the leader of Latveria. Sue uses her invisible force fields to toss Doom out a window. Reed deduces that the “berry juice” is making them hallucinate. He and Sue track down Ben and Johnny and break up their fight. Our heroes take the fight back to Doom at the Baxter Building, where Doom intends to take over the place. He now has a force field of his own, which is too strong for Ben to punch through. Reed hands Johnny a rod wired to the building, and instructs Johnny to fly up above the city and unleash his nova flame. Johnny does so, lighting up the sky over New York. All the energy from the nova blast shorts out Doom’s force field. Unfortunately, it leaves Johnny too weakened to fly to safety. Reed catches him, burning his hands in the process. Ben has Doom restrained, but Doom fights back with a miniature paralysis ray. Sue tries to stop him with invisibility, but his armor’s built-in radar catches her. 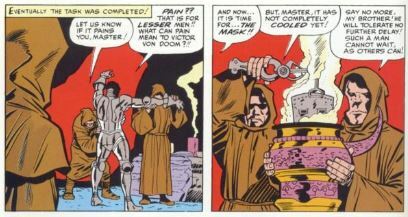 Reed stops the fight and offers Doom a challenge to determine once and for all whose is the superior intellect. They drink to it, and then Reed pulls out the Encephalo-Gun. This is a weird-looking thing that hooks up to Reed’s and Doom’s heads at once. 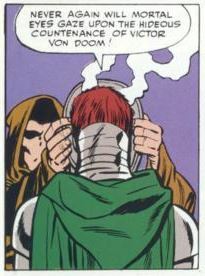 The one with the inferior brain, Doom says, will be banished to limbo. It’s a tense standoff, ending with Reed vanishing before everyone. Doom declares his victory, and walks out, leaving the other three to wallow in their shame, knowing that they’ve been defeated. Unstable molecule: Reed outsmarts the baddie again, but his real hero moment is when he rescues Johnny, knowing he has to burn himself severely to ensure his teammate’s survival. It’s a powerful scene. Fade out: Reed is kind of a jerk to Sue in this one, at first not noticing her romantic advances, and then by insisting she sit out the final fight. Her other two teammates back her up, though, and she stays by his side throughout. Just before Reed takes on Doom at the end, he tells Sue he loves her, so I guess he comes around. Clobberin’ time: During the Fantisticar fender-bender, Ben crunches up the jerk’s car and then sells it some guy as “pop art.” Because it’s the ‘60s. Trivia time: This is the first appearance of Latveria, and this pretty much sets the stage for the rest of Doom’s appearances from here on out. Before this, he was more or less a mad scientist with an arcane background, pulling off a bunch of elaborate stunts. Now, with a ruler of his own nation added onto that, the writers suddenly have a lot more to play with. Doom isn’t just a scary villain, he’s a world leader who happens to be a scary villain. Fantastic or frightful? Attention, people in Hollywood who are working on a Fantastic Four movie reboot: THIS IS THE TYPE OF THING WE WANT. Sure, the “berry juice” and the Encephalo-Gun are silly, but look beyond that. The first half of the issue is not superhero action, but a character study, a portrait of a talented yet flawed man with huge ambitions. This detailed origin puts us inside his head, and shows us where these ambitions come from. We better know who Doom is now. Add to that the visuals, with Doom lurking in his gothic castle or wandering the moors at night. Then, add to that him turning the FF against each other, bringing their emotional crises to the surface and exploiting them for his gain. 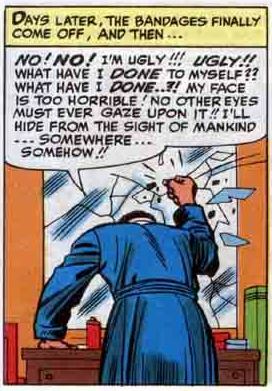 THEN, add to that Doom’s moment of weakness all alone, too horrified to stare upon his own damaged face, which both humanizes him and makes him frightening at the same time. This is the type of rich, complex characterization we want, need, and deserve from an FF movie.